Well here in the US we only have hours left in 2013, but many of my friends abroad are celebrating the New Year. For those of you that are already in 2014, Happy New Year. I wish you well in the New Year. I hope that everyone has a great New Year’s Eve. It’s a time to reflect on the year going out and on the possibilites of the new year. For me I am excited about the coming year. I’ve set many goals that are exciting and extremely positive. I’ll let you in on them as they unfold, but for now I’ll just keep them under wraps. I have several books in the works that will come out in 2014. That’s exciting and scary. Why does it always scare me when I hit that publish button? The work will have gone through many edits and rewrites, but it’s still a anxious time. Will my readers like it or will it be a huge disaster? I guess that’s the art of this line of work. As you celebrate the new year remember those that were lost in 2013 and those that were born. It was a year of many changes and so many laughs. I’m honored to have been featured in three magazine articles in 2013 and I gained many new friends through my blog and writing. I want to thank all of my wonderful, adoring fans that write to me and make my work worth while. Thanks to all my colleagues who support me and give wonderful advice and sometimes even a high five when something goes right. So, celebrate and be safe on this New Year’s Eve. I love you guys, you’re all wonderful. See you in 2014! Categories: Uncategorized | Tags: Avon Romance, avonromance.com, Celebrate, Fans, Love, Magazines, New Year's Eve, Publishing, Writing | Permalink. It’s weird to say that. I’ve been thinking back to 2013 and it’s been a great year. There’s been good and bad throughout the year, but for the most part it’s been great. It was the first full year of being a published author. How are you spending the last two days of 2013? As for me I’m working today, but taking tommorow off. I’m trying to finish one of my books before midnight tommorow, but maybe not. It’s funny how you plan on time to write during holidays and then life steps in and you don’t get it done. What are your plans for New Year’s? We spend it at our Church. We have the best time eating finger foods and singing. Then we bring in the New Year at the altar. It’s a great way to thank Him for the past year and for the new year to come. Of course I have games and prizes for the kids. They even get to wear their pjs which helps parents just put them to bed when they get home. Hopefully everyone has set their writing goals for 2014. Categories: Uncategorized | Tags: blessings, Church, God, Monday, New Years, thanks, Writing | Permalink. What makes a good romance for you? Romance novels come in many genres. It’s amazing how they’ve changed since I first picked up my first romance. I remember the intense feelings that the book brought out. It was based in Europe in the World War 2 era. I remember crying, laughing and being inspired to find my Prince Charming. I also remember finding out through reading that my Prince Charming would not always be perfect as the fairy tale goes. For me a good romance needs to take you to another place. I want to be taken away from my normal world and transported into a exotic place, mystical place or just another time. I want the book to carry me away with emotions. The writer needs to make me think I’m there with the character, feeling the emotions, the anger, the sadness, the love, and especially the romance. I want to be able to still feel it even after I put the book down. I can’t even imagine how many romance novels I’ve read in my lifetime. Recently I went through my collection of novels that are stored in my attic. I had to put them in plastic storage boxes as the boxes were falling apart from age and over use. It’s amazing how many times I’ve read some of them over and over. I even pulled some of them out and read them again. There’s nothing like the feel and smell of a aged book. The yellowed pages pull you in and keep you engrossed. I had several authors that I bought everytime I saw a new book in their collections. As I reboxed them I separated them by author. The publishers of most of them are still around, such as Harlequin, Avon and many others. I always knew if it had the Harlequin or Avon symbol on the side that it would be great. I remember going to flea markets and browsing hungrily through the many shelves of used books. As a teenager it was like a scavenger hunt for more titles from some of my favorites. A couple of my favorite books have been purchased a couple of times. You may be wondering why, well let me explain. I would lend them out and they never got returned. Then I would go on a mad search for them. When I’d find them again, they would stay with me. So for me a good romance needs to make an impression. I want to think about it again and again even after I’ve read The End. I want to read it over and over and still fall in love. The characters need to pull at my heart strings. I want to be able to see them in my mind’s eye and carry that throughout the book. Recently I heard from one of my dear fans. She told me that the descriptions of my characters made her see them clearly. She said that she felt like she knew them personally as she read through to the end. I was pleased that I’d accomplished that goal. Sometimes that can be a hard thing for a writer. You have to make sure that your character is well thought out and explained. If they are blonde, make sure they are blonde throughout. I read a book not too long ago and the main character started out as a blonde and the writer somehow I guess forgot and by the end their hair was ebony. And no they didn’t change hair color out of a bottle. It totally blew my mind. I love to read a romance that makes me cry. It doesn’t have to be from sadness, but it could be just the sweetness of the romance. I have several books that I read over and over that make me cry every time. It’s just such a sweet, tender romance that it draws out the emotional part of me. So as you write, think about what draws you in. If you like time travel, then write about time travel. If you like a good, sappy romance, then write that sappy romance. If it’s erotica you love, then write erotica. Everyone has a niche and you have to find that niche. For me it’s the tender, sweet love story that builds throughout the story. I try to throw in a little intrigue and mystery, but in the end it’s the romance that draws you in. Categories: Uncategorized | Tags: Author, Avon Romance, avonromance.com, Books, crying, Harlequin, Love, Love Story, Mystery, Romance, Time Travel, Writing | Permalink. Goals… Do you set goals? Do you have a word count that you try to meet everyday? Do you try to put out a couple of books a year? Well for me I try to work everyday on my manuscripts. Sometimes life steps in and I get side stepped, but I plan to make up for lost time this weekend. For me goals are important. If you don’t have something to strive for then what’s the point. I have set goals on my book releases and also my accounting business. Life is going to be getting very busy in January. If you haven’t read my bio, I am an Accountant and that means tax time is right around the corner. What’s funny is the last two years when I would get the busiest in my office, the characters would get restless and I’d actually have higher word count outputs. Weird but true. I had an accounting colleague ask me last year how on earth I wrote during tax season. Well it’s really easy when you need something to decompress with at night. I usually work really long hours from January through April, but when I do get to sit down and focus, I can just spit it out like a rushing river in a flood. Amazingly enough I actually have my daily schedule set up this year for writing to be intertwined with accounting work. That way I can decompress during the day too. I have several goals set for the new year. I want to get my 2nd books in the Lean On Him series, Alpine Romance Series, The Winner Series and The Women of Magnolia Hill Saga out and going as soon as possible. I laughed as I worked on my goals for 2014 and realized I had several series going along with some stand alones. Funny how writers can have several dramas going on at one time. So, what are your writing goals? What are your expectations for 2014? Do you have a plan? Categories: Uncategorized | Tags: Authors, Avon Romance, avonromance.com, funny, Goals, New Year's Goals, reading, Romance, Sagas, series, Writers, Writing | Permalink. Well, all’s said and done on this Christmas season. The gifts are opened and the food consumed (Sighing heavily)… As I walked into my den this morning I groaned. I was met with the mess that I ignored last night. It looks like Rudolph and all his reindeer trampled through my den and did the two step. What’s your plans for the next couple of days? Are you writing, cleaning, or a combo of both? I’ll be doing both as I ponder the new year. I wonder what the new year will hold for my writing career. I have some plans for submitting a couple of manuscripts to Avon. We’ll see how that goes. Last week I was surprised by a wonderfully sweet card from a reader who received one of the giveaways in December. She was very appreciative and said she couldn’t wait for the rest of the Saga to come out. Of course I’m talking about the giveaway of “Victoria”. The next book will be coming out in the Spring, so keep an eye out for updates. I do hope all of you had a wonderful Christmas. Categories: Uncategorized | Tags: Author, Avon Romance, avonromance.com, Christmas, Cleaning, December, Giveaways, manuscripts, Mess, Reindeer, Rudolph, Saga, Writing | Permalink. Good chilly morning to all… I do hope everyone is ready for Christmas. I’ve still got some baking to finish and payroll to complete, but the gifts are bought and wrapped. Well all but one and I tripped over it this morning in the bedroom, LOL. I’ll wrap it when I get back from delivering payroll. ‘Tis the season to be jolly and why is it that most people this year are not jolly? My son and hubby are not in the Christmas spirit. It’s driving my insane. I’m going around singing Christmas carols and decorating everything that’s not standing still. They just sit and look at me like I’ve lost what’s left of my brain. Well, maybe I have, but it all went into my books. Last night I was thinking of spending it finishing up the latest manuscript that’s captured my little brain and then it hit me. “I’ve got to put some Christmas spirit in these men of mine.” So I whipped out “Frosty The Snowman” and “Rudolph The Red Nosed Reindeer” and told them to sit down and enjoy. Of course I giggled like a school girl and they just sat there and made fun of Rudolph’s red nose. Oh well, I tried. So here’s hoping you all have a wonderfully Merry Christmas Eve and hope Santa is very good to you. Remember to smile at someone you don’t normally smile at, hug your loved ones and sing carols even if they’re out of tune. Put the Christmas spirit in your whole day and enjoy the season of joy. Don’t forget the reason for the season as you celebrate with family and friends. Tell Jesus Happy Birthday! Categories: Uncategorized | Tags: Avon Romance, avonromance.com, Birthday, Celebrate, Christmas Eve, Christmas Spirit, family, friends, Jesus, Love, Romance, Writing | Permalink. Well it’s been another rainy day here in Georgia, but now the temperature is dropping and it’s feeling more like Christmas. As I sit here by my Christmas tree with a crackling fire I’m thankful for so many things. Second I’m excited because tommorow is Christmas Eve and if you’ve followed my blog for the last two years you know I love Christmas. I get to be with family and friends being all Merry and happy. Third I’m working on several manuscripts getting them polished up for a after New Year’s release. My writing has been an inspiration and a big stress reliever. I’ve gained so many new friends and fans through this blog and my writing. I’m excited about what 2014 holds for my writing. At the bottom of this post I will be giving you a sneak peak at the cover for one of my newest works that’s coming out after New Year’s. Christmas spirit is filling my heart and soul. I almost want to write another Christmas romance but alas it’s a little late for that. Maybe it’ll keep until next year. I’m ready to celebrate the Savior’s birth on Wednesday. It’s a wonderful time of year to do something nice for someone else. Make sure you tell everyone you love them and give them a hug. Give a little Christmas spirit everywhere you go. 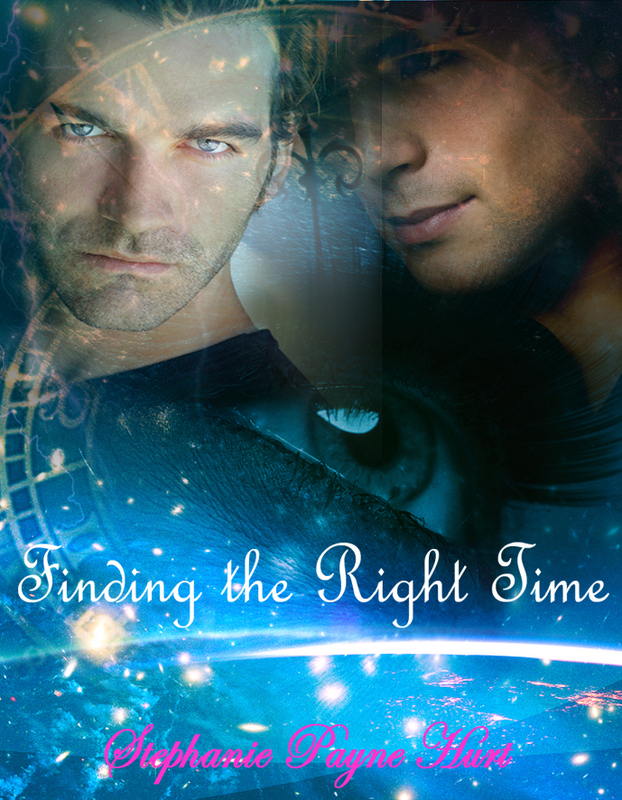 Here’s a sneak peak at the cover for Finding The Right Time. It’s a time travel romance and I’m really excited about this one. Take a look at this awesome cover that my cover designer created. We spent several hours on this one and I think it’s our best yet. Categories: Uncategorized | Tags: Authors, Avon Romance, avonromance.com, Books, Christmas, Christmas Spirit, Covers, family, Finding The Right Time, friends, Merry Christmas, Writing | Permalink.